Responsible breeders carefully plan their litters. Breeding plans includes the evaluation of conformation, health, inherited disorders, intelligence, pedigree analysis, structural soundness, temperament, training attitude, and working ability if applicable. They look for a sire that will complement the strengths of their female and help improve on any weaknesses. The specific goals of a breeding program vary based on the breed and the specific interests of the breeder. The following information focuses on Labrador Retrievers, however, the basic principles apply to most breeds. Labradors are active, smart, trainable dogs that love to retrieve. Intelligence and an eager-to-please attitude are classic trait in the Labrador breed that should be maintained in breeding programs. The specific goals of a breeding program may vary depending on the activities the breeder has in mind for their dogs, such as dog shows, field trials, hunting, therapy, service, or obedience trials. Generally, both the field and the show lines have a strong desire to retrieve. Both lines produce Labradors with hunting ability. The American field type Labradors are energetic athletic dogs with a very strong drive in the field. Show type Labradors can be trained to hunt, but they usually lack the speed and intense drive that is characteristic of the field type Labradors. The show line Labradors tend to be more mellow than the field line dogs. The evaluation of conformation strengths and weakness is an important aspects in the selection process. Dogs with significant conformation faults and/or significant structural weaknesses due to poor conformation should not be used in breeding programs. The Labrador is a sturdy, short-coupled, athletic dog with well-balanced structure. Dogs with minor conformation faults can be selectively bred with the goal of improving the conformation of the offspring. Breeders that exhibit their dogs emphasize show conformation in their breeding program. Breeders that focus primarily on field trials and hunting ability tend to breed for lean athletic Labradors with a strong drive in the field. Correct structural conformation is an important consideration for working lines. Labradors with disqualifying coat colors and markings are eliminated from breeding programs. AKC disqualifications includes the Dudley nose (a nose without pigmentation). Any color or combination of colors other than black, yellow or chocolate are disqualifications. This includes gray or silver, charcoal, and champagne coloration. 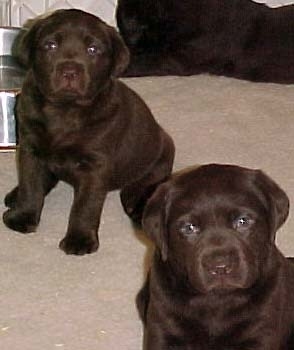 Occasionally, Labradors are born with brindle markings, black and tan markings, or a large splash of white on the chest. These Labradors are normal, healthy dogs that will be wonderful companions. In reputable breeding programs, healthy, sound dogs are considered potential breeding dogs. Labradors with hip dysplasia, elbow dysplasia, TVD, epilepsy and other serious inherited disorders should be excluded from breeding programs. The risk of puppies developing many inherited disorders can be reduced or eliminated by DNA testing the sire and dam. The OFA method is qualitative and subjective. Their hip evaluation procedure is based on a single x-ray view. The ratings are based on how deep the head of the femur fits into the hip socket. The results may be incorrectly rated if the hips are positioned incorrectly. The 3 vets that review the films may rate the hips differently. The PennHip evaluation is a quantitative and objective procedure. The veterinarians preforming the procedure must be certified. The PennHip procedure measures how tight the head of the femur stays in the hip socket. During the testing procedure, pressure is applied to move the the femur out of the hip socket. A trained professional rates the distraction index based on precise measurements. The PennHip procedure may be a better predictor of hip dysplasia. Annual eye clearances are recommended. Cardiac clearance by echocardiogram will reduced the risk of Labrador puppies developing Tricuspid Valve Dysplasia. Reliable DNA testing for more than a dozen inherited disorders in Labradors is now available. The recessive genetic disorders that can be prevented in Labradors include Centonuclear Myopathy, Copper Toxicosis, Degenerative Myelopathy, Exercise Induced Collapse, Hereditary Nasal Parakeratosis, Progressive Retinal Atrophy, Retinal Dysplasia/Oculoskeletal Dysplasia, Skeletal Dysplasia 2, Cystonuria, Elliptocytosis, Hyperuricosuria, Myotubular Myopathy 1, Narcolepsy, and Pyruvate Kinase Deficiency. Affected individuals inherit 2 abnormal recessive alleles, one from each parents. Unaffected carriers have one normal and one abnormal allele. All the offspring of an affected dogs bred to a dog with 2 normal alleles will be unaffected carriers. Half of the offspring of a carrier bred to another carrier will be carriers, 25% of the offspring will be normal, and 25% will be affected. If a carrier is bred to a dog with 2 normal alleles, none of the offspring will develop the recessive disorder. Half of the offspring will be carriers and half will be normal. Should Labradors that carry an abnormal gene for recessive disorders be bred? If none of the affected dogs and carriers are bred, wouldn't these inherited disorders be eliminated from the Labrador gene pool? Realistically, no. Not enough Labrador breeders have DNA testing done on their dogs. Are there any disadvantages associated with eliminating all carriers from breeding programs? Mostly likely yes. Removing all known carriers from breeding programs could alter the Labrador gene pool. Genetic diversity promotes soundness and a more stable gene pool. Lack of diversity increases the risks associated with inbreeding, and could decrease the frequency of genes associated with many desirable traits. Generally, it's the reputable breeders that have DNA testing done on their Labradors so the quality of their dogs is usually above average. A dog that carries an abnormal allele for a recessive inherited disorder may have dozens of genes that promote good health, structural soundness, intelligence, correct conformation, a desirable temperament, and good working ability. Many inherited recessive disorders in Labradors can be prevented with DNA testing and the selection of an appropriate breeding pair. Responsible Labrador breeders often have their dogs tested for at least a few recessive genetic disorders. The Canine Health Information Center recommends testing Labradors for EIC and the d allele. CHIC lists DNA testing for CNM and PRA as optional tests. Some breeders also test for additional recessive disorders. Frequently used stud dogs can have a significant impact on the Labrador gene pool. Responsible stud owners with a dog that is a carrier will only breed their males to females that are clear of the abnormal allele. Don't throw out the baby with the bath water? If Labrador breeders stopped breeding carriers, the frequency of the abnormal allele in the gene pool would decrease. This practice could also reduce the genetic diversity in the breed and decrease the frequency of desirable genetic traits. Many inherited disorders in Labradors can be prevented in future generations if carriers are only bred to dogs with 2 normal alleles. The negative impact on the Labrador gene pool would be minimal. A dog's pedigree is it's family tree. The pedigree can provide valuable information about previous generations of the potential sire and dam. This information can have a positive influence on future generations. Titles earned at AKC qualified events will be noted on the pedigree. Examples of title abbreviations include BIS (best in show), BISS (best in specialty show), CH (champion), FC (field champion), JH (junior hunter), NA (novice agility),OA (open agility), TD (tracking dog), and UD (utility dog). Keep in mind that many dogs in a pedigree without titles may be show-quality or have strong working ability in the field. The Canine Health Information Center (CHIC) provides a centralized database for breeders, dog owners, and researchers. It is sponsored by the Orthopedic Foundation for Animals (OFA), an organization that evaluates and rates hip and elbow x-rays. OFA will also post eye clearance, cardiac clearance, and DNA test results if the owner submits the proper documentation. Breeders can research multiple generations of health clearances of a sire or dam. This information can help breeders reduces the risk of hip dysplasia, elbow dysplasia, inherited eye disorders, and some recessive genetic disorders in their breeding program. Prospective dog owners can also review this information on the OFA website. The registered names of many Labradors includes the kennel name of the breeder. These breeders often have websites that post pictures and relevant information about their current and retired dogs, including health clearances and AKC titles. Information in the pedigree indicates the level of inbreeding in the lines. A breeding is an outcross if there are no common ancestors in 5 generations. This type of breeding results in more variation in the puppies. The practice of inbreeding involves breeding close relatives, such as fathers to daughters, brothers to sisters, and sons to mothers. Inbreeding practices improve specific desirable traits such as hunting ability or conformation traits. Inbreeding can result in the loss of genetic diversity. Some diversity in the gene pool is very important. After a few generations of inbreeding, a carefully planned outcross is should be considered to maintain some genetic diversity. Linebreeding is a milder form of inbreeding. Examples include breeding cousins to cousins, uncles to nieces, and nephews to aunts.In a 5 generation pedigree there will be a few common ancestors. This type of breedings concentrates valuable characteristics including health, soundness, temperament, and various physical traits. Linebreedings help maintain previous improvements in the line. Also, they may add some unexpected desirable traits to the gene pool. Compared to close inbreeding practices, there is more genetic diversity in linebred dogs. Also, the risk of detrimental recessive genes coming together is lower in linebred dogs. An occasional outcross should be considered to add new genetic material to enhance genetic diversity. Labradors with temperament problems, such as aggression, should be excluded from breeding programs. A Labrador is a happy, kind, loyal dog that is friendly towards both people and dogs. Most likely, multiple genetic factors contribute to the temperament. Variable environment factors may play a role in the development temperament problems. Due to the complex nature of temperament, the probability of correcting a problem is low.